Bernie Sanders Has Lofty Goals, but Can He Execute Them? Democratic presidential candidate Sen. Bernie Sanders speaks as the Rev. Al Sharpton looks on during the 25th annual National Action Network convention April 14, 2016, in New York City. Democratic candidate Hillary Clinton spoke April 13 to the group, which raises national issues of importance to black Americans. Clinton and Sanders will meet for a debate in Brooklyn, N.Y., the evening of April 14. What Sen. Bernie Sanders lacks in substance, he makes up for in being personable. Let me explain. The Vermont senator’s political ambitions are idealistic and radical. He has grandiose ideas to revolutionize government. Like all politicians, he has blind spots. His blind spot is he lacks concrete plans to bring his ideas to fruition. This was made abundantly clear during his National Action Network speech at the Sheraton Hotel in New York City on Thursday. “All that stuff he said, ain’t gon’ happen,” an elderly black woman said before Sanders took the stage. Along with three other women who appeared to be in their 60s or 70s, they ripped the presidential hopeful to shreds throughout his entire speech. The complaint? If Sanders truly could deliver on his promises of police accountability, job creation for youth, pay equity and raising the minimum wage to $15, why hadn’t he done it in the two decades he’s been in Congress? “He been in politics over 20 years. What he do? I don’t wanna hear that s—t,” one of the ladies in the peanut gallery hissed. At 74, Sanders is not a gifted speaker. He rattles off his points by listing “first, second, third.” He jumps around from topic to topic without a cohesive flow. He’s not a master politician in the way Hillary Clinton is, either. 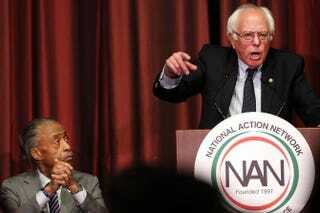 Although he quoted Martin Luther King Jr., mentioned his attendance at the March on Washington, noted his vote against the Welfare Reform Act of 1996 and spoke on how he supported Jesse Jackson’s presidential run at a time that was unpopular to do so, it still didn’t feel like the kind of pandering to blacks that I'd heard the day prior from Sanders’ Democratic rival Clinton. There was no Southern Baptist sermon. He did not tailor his speech to blacks only. He talked about changing America. When he mentioned the issues that disproportionately affect blacks, it was nothing we hadn’t heard him say before to mostly white crowds of tens of thousands. “What Dr. King understood was, of course, you have to destroy segregation … but what does it matter if you desegregate a lunch counter, but don’t have the damn money to buy a hamburger,” he roared. I could have done without the several King references, but I was satisfied that he at least didn’t quote Scripture and name-drop a legion of black leaders. If you’re black in America, anyone can understand why you’d be a cynic about the American political system. It made sense that the raspy-voiced elder behind me repeatedly said, “You ain’t gon’ do s—t.” There was a tiredness in her voice. Tired of being promised bills and policies that will help her only to be left behind once elected. While universal health care, free college tuition, rebuilding infrastructure, raising minimum wage, ending corporatized prisons, investing money into education and ending the police’s lethal force on unarmed citizens all sound like a wonderful utopia, Sanders has not convinced me that he can execute these lofty hopes. “No substance,” the middle-aged lady next to me said. “How’s he doing all this? Where’s the money coming from?” The same woman called him inspiring and began texting someone a photo of Sanders, typing, “Feel the Bern,” before deleting and settling on sending the photo with no caption. Sanders had a lot of criticism to go around. He criticized the GOP. “I’m tired of people figuring out ways to shrink the voter turnout,” he remarked. “We have to expand the voter turnout.” He criticized the media for engaging in campaign gossip: “It is more important to know what’s happening to the people in America.” He criticized the police who kill unarmed citizens: “A police officer must be held accountable if they break the law.” He had a lot to say about billionaires’ money influencing government. But while his speech was heavy on how America needs to be changed, it lacked why he’s the man to do it. If I were tasked with choosing one difference between Sanders and Clinton—there are many—it would be what happened after his speech. Sanders stepped off the podium to shake hands and take pictures. He patiently shuffled through the swarming crowd with cameras in his face. He shook hands. He took selfies. Clinton had simply left. Sanders appears to be a people person. He had the decency to touch and mingle with the people whose votes he was seeking. And that matters. I think Bernie is on to something—government as we know it does not work for the vast majority of American people. I only wish he could demonstrate how he plans to execute these drastic changes. Can being likable override not being able to articulate specific ways thathe can fix America? I don’t know. But President Barack Obama was a one-term senator with community-organizer experience when he ran and won on a platform of change you can believe in. Anything is possible. Bené Viera is a Brooklyn, N.Y.-based writer and columnist who has written for Essence, VH1, XOJane, Vibe and CentricTV.com. Catch her daily musings on her blog and Twitter.